The list of exhibitors attending Wakefield 2019 currently includes the following companies and individuals. We’re still adding names, though – so watch this space for updates! 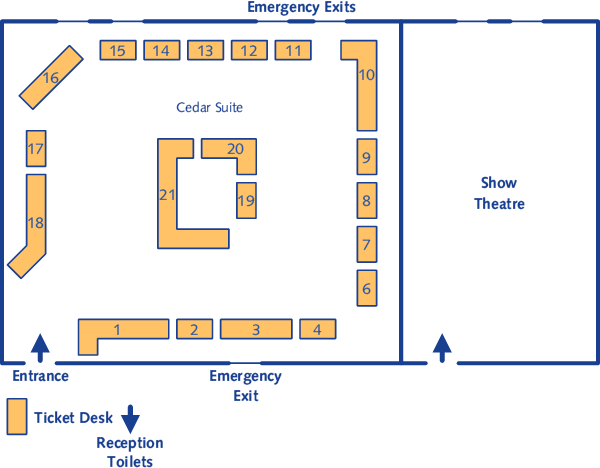 The floorplan and stand numbers are provisional, and still subject to change. If you would like attend the event as an exhibitor, then please contact us for more information or to book your place – spaces are available on a first-come, first-served basis. This year we’ll be diving on the Mary Rose on an A5000 – let’s see how many artefacts can be found by the end of the show! Also we’ll have demos of open source WiFi-modems and solid-state-storage for old machines. This is coupled with a revisitation of some esoteric 8-bit programming language challenges if anyone wants to dust off their BCPL. This year we are holding the Stardot High Score Challenge again. The games will probably be Frogger, Chucky Egg, Arcadians and the amazing new port of Stunt Car Racer. You can also play any game from the beebs back catalogue or one of the more recent releases on one of our machines, just ask! We’ll also have information on ABug meets past and future and a display of interesting BBC Micro books. AMCOG Games will be releasing our next title at the Wakefield show. The current working title for this game is ‘Escape from the Arcade’. We also have updates to our catalogue which will by then consist of 10 titles which may be bought on either USB or CD. All games come with a Plingstore download code, free updates and full source code. Original music will also be available to buy. Come along and try out our original titles or to discuss what you would like to see developed for RISC OS. ABR – Advanced Battery-Backed RAM : Electron/Master. ATI – Advanced Tube Interface (with ABR) : allows all known 2nd processors to be used : Electron. ARA – Advanced ROM Adaptor : 2 x ROM sockets : Electron/Master. AP5 – Dual User Port, 1MHz Bus and Tube interface – demonstrating BeebSCSI : Electron. AP6 – ROM expansion card – fits inside the Plus 1 : Electron. MGC – Mega Games Cartridge – holds up to 198 Games : Electron. Plus 1 Support ROM – Adds ROM utilities to support the above products : Electron. Slogger Pegasus disc interface : Electron. Low cost programmable ROM cartridge : Electron/Master. Prototype ideAIN – 16bit IDE interface. Prototype Arcin32 – 32bit IDE interface with DMA – Blitz replication! Over the years, our charity stall has raised over £20,000 for good causes. At Wakefield 2019 we will again be selling donated goods in aid of Wakefield Hospice. See the Charity page for information on what donated items we can accept. This year I shall be showing some commercially produced articles which were created using RiscOSM, ArtWorks, Impression-X, FamTree and MakeDraw. I will have a level crossing simulator connected to a data monitor, principally to demonstrate the latter in operation. I shall also be demonstrating my FamTree software and GPS units. Small displays with HDMI input have in the past been either extremely expensive or only available uncased. 4D are now pleased to be able to offer both 7” and 10” LCD monitors with multiple input options which include HDMI. A selection of models from our RapidO range will be available - The latest and best RISC OS systems money can buy! The archive will be hosting BBC computers connected to an Econet network showing some of the latest educational software acquisitions. There will also be a Raspberry Pi set up as a web browser to view the full educational archive on line. In addition there will be an opportunity to see some of the hardware and software that we use to test and archive software acquisitions, items such as disk cloners, concept keyboards and digital storage methods. The Online Social Media tech channel, fronted by Ident Computer’s Tom Williamson, makes a return to the RISC OS show circuit! Showcasing some of the projects and hardware as seen on the Wi-Fi Sheep YouTube Channel, Twitch live stream service and Twitter platforms. Plus, Ident Computer products will once again be available to purchase from our stand. If you’re a fan of our online content or previous customer of Ident Computer then please come and say hi – we’d love to chat! MUG will be publicising the user group and offering the chance for attendees to the show to try out their programming skills by amongst other things using a USB Robotic Arm, Python and also Scratch. In addition we will demonstrate a modified RISCOSbits Wispy set up that utilises an RTC clock. North One will be at Wakefield with the latest version of Organizer, the personal information manager for all RISC OS platforms. Laptops, laptops, everywhere! Web browsers, ARM-powered computers, NetFetch 5.5 and Fireworkz Pro 2.22, to name a few Lots to see, lots to do... ARMX6s and Titans for me and you! We’ll be on hand to answer any questions relating to the open source flavour of RISC OS, and also accepting pledges to kick start the latest bounties which underpin the future direction of the operating system. Get hands on with demonstrations running the latest RISC OS 5, and merchandise to buy on the day including our ever expanding series of books. RISCOSbits will again be selling the usual range of alternative hardware, including our exclusive RISC OS themed acrylic cases to suit every budget. We will have stocks of the PiCog and PiSSDup cases for the Raspberry Pi, the Deuce Case for Pi or Wandboard, and the UniqAce for well, lots of RISC OS boards and others beside! We have exclusive stocks of Ident’s RiscCE cases for the Raspberry Pi. We will be showing off our Qadro and PiHard range of configurable small-footprint RISC OS computers with 2.5in SSD for more robust storage. We will also have stocks of the ultra-budget PiRO and the miniscule Si.zeRO. We will be showing off our docks to compliment RComp’s mini.m and other SolidRun CuBox machines, complete with mSATA drive and USB hub. Plus we will have a few refurbished portable computers for sale, including Pi-Top v1 and v2 machines, and a rare Lapdock, plus many more of our usual items, including PiPODs, plus a few special items, maybe including one or two new things! I’ll be showing VideoNuLA as usual, my enhanced graphics board for the BBC Micro. New for this year will be my work-in-progress port of the PC game Doom running on the Beeb. In addition, I’ll have my ZX81, Jupiter Ace, ZX Spectrum and Amstrad CPC emulators for the BBC micro. Plus the Raspberry Pi co-processor running DOS, Panos, CP/M, Flex, ARM etc. I’m also hoping to have Double Phantom Combat running so people can play against each other using two machines. We will have yet another new version of RiscOSM, our popular mapping software, and demonstrating Recce which we released in February. Recce gives access to photographs from Flickr and Google Street View for use with your RiscOSM map. The new release of RiscOSM will include the ability to show bus routes and long-distance footpaths on the map, and maybe one or two other new features. Updated map data will also be available for sale. We will also be selling our database software Impact and puzzle/game applications SuperDoku, Wrangler and House of Cards. Soft Rock Software will once again be selling the ‘Collection’ on CD and USB flash drive. The Collection features a variety of the company’s old budget games, along with WebChange, Seek’n’Link, and other items. The RiscPiC-mini cases for the Raspberry Pi will also be available to buy - and making its Wakefield Show debut, there will be a very limited number of the larger RiscPiC-standard. Come to the stand and join the club that runs the Wakefield Show. We have members all over the UK. Membership is half price at 7.50 ukp in the first year. Pick up the latest edition of the newsletter CD at 10 ukp for non-members, or join the club and get the CD at the members’ rate of 7.50 ukp. Don’t forget the prize draw is also taking place on the club stand, with a RISCOSbits PiRO Core and 16GB OS Card in custom engraved Wakefield 2019 case as first prize, and there will also be a second prize and third prize – details to follow.